Parasound Halo Integrated review | What Hi-Fi? We’re no strangers to testing high-end integrated amplifiers, but they are normally purist affairs where every feature has been stripped back in the pursuit of sound quality. Parasound’s approach with its Halo Integrated is unusual, and refreshingly accommodating. It’s as though the company has made a genuine attempt to build a high quality unit that’s as flexible as possible. Think of every feature you could reasonably expect to find in a premium stereo integrated – and the Halo probably has it. You get a switchable phono stage, a headphone output and even tone controls. We can’t remember the last time we reviewed a product such as this with bass and treble controls. And despite what the purists say, on occasion, for example when playing a poorly engineered recording, they can be useful. They can be switched out of the signal path when not needed, giving a slightly clearer sound. 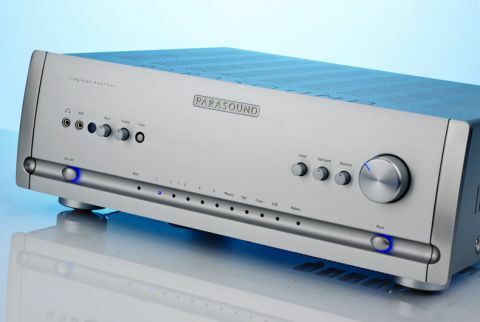 Parasound calls the Halo Integrated a 2.1 channel amplifier. It has outputs for a subwoofer and the option to set the crossover frequency. There’s a dedicated preamp feed too. Unusually, this also features a (high pass) crossover that can be switched into circuit. This combination of features gives a great deal of flexibility in the set-up of a stereo speakers/ subwoofer combination. We can’t imagine this amplifier getting caught short in a conventional two-channel context. There are five single-ended line-level inputs plus a balanced XLR option. The built-in phono stage can cater for both moving magnet and moving coil designs, but here too, Parasound has offered more than you’d expect. The moving coil input (52dB of gain) has two cartridge loading choices – 100 ohms and 47k ohms – that offer a degree of fine-tuning we only usually find in dedicated outboard phono units. The ability to optimise performance will usually lead to a better sound. There’s also a ‘home theatre’ input that bypasses the amplifier’s volume control and feeds the signal straight into the power amplifier section. This is useful if you want to integrate the Halo into your surround set-up, say by using it to power the front left and right speakers and leaving your AV amplifier to drive the others. Digital is well catered for. The Halo Integrated uses the well-regarded ESS Sabre ES9018K2M DAC chip. It’s something we find in many premium digital products, usually delivering excellent results. There’s the usual trio of inputs – USB, coax and optical – with upper limits of 32-bit/384kHz for the asynchronous USB and 24-bit/192kHz for the other options. DSD is also on the menu, with the amp’s module happy to accept anything up to DSD 256. In short, the Halo will cope with just about every music file you’re likely to have. Build quality is as good as we’d expect for the price. The Halo’s appearance splits opinion among our test team – some thinking the LEDs on the front panel a touch overdone, others not liking the control layout – but there’s no denying the solidity of the casework, or the care taken in the finish. The supplied remote splits opinion too. We like the simple button layout, but it doesn’t feel luxurious. Take the lid off the amp and you’ll find a generous power supply, shielded toroidal mains transformer and plenty of heatsinking. The power supply and power amplifier are arranged in a dual-mono configuration to aid stereo imaging. The rated power output is 160W per channel into 8 ohms and rises to 240W per side as impedance halves. We’re impressed by the peak current output figure of 45amps, too. That’s a lot of grunt, certainly enough to get good volume levels from just about any speaker this amplifier is likely to be partnered with. The Halo’s accommodating nature builds on this ability to drive speakers well. This amplifier has a beautifully judged tonal balance that sounds bang on neutral to our ears. This means any tonal character is much more likely to come from your speakers, or to a lesser extent your source or cables. If you end up with a tonally unbalanced sound we can say with some confidence that the Parasound won’t be the problem. So far the Halo is doing everything right. It’s packed full of useful features and is easy to match. If you’re expecting performance to be the downside you’ll be disappointed. What makes this integrated special is that despite being fully loaded, it sounds good too. We plugged the Parasound into our usual reference set-up of Naim NDS/555PS streamer, Clearaudio Innovation Wood turntable and ATC SCM50 speakers and it sounds right at home. Considering that all of these items cost a minimum of four times the Parasound’s price, that’s quite some achievement. We start off by feeding the amp’s line level input a bit of Bob Marley. It copes well, delivering the free-flowing bassline of Get Up Stand Up with enthusiasm. There’s plenty of power and authority, coupled to a pleasing sense of agility. We like the way this amplifier renders the song’s rhythmic drive: it’s surefooted and precise. The pricier, but far less well equipped, Naim SuperNait 2 shows more in the way of momentum and reveals subtle pace changes more easily, but the Halo does well enough to hold our interest. Move up the frequency range and the Halo continues to impress. Marley’s vocals come through with subtlety and passion. It’s a clean midrange, perhaps lacking a touch of natural warmth, but brimming with clarity. The top end is crisp and has plenty of bite. It’s nicely judged, though, staying on the right side of aggressive even when provoked by coarse recordings like Bruce Springsteen’s Terry’s Song. We move to Tchaikovsky’s 1812 Overture and the Halo sounds right at home. Here it delivers a large sound stage – one that’s impressively wide – and layers it with skill. Instruments are precisely positioned and focussed with care. They stay locked in place regardless of volume level or musical complexity. The Halo copes brilliantly with the music’s demanding dynamic swings and stays firmly in charge when the piece becomes busy. It never sounds rushed or strained, and it’s this composure that helps the listener relax and just enjoy the music. There’s plenty of refinement here, and a degree of finesse that eludes similarly powerful rivals. Given a piece of music such as Beth’s Theme from Olafur Arnolds, the Parasound excels. It renders this heart-breaking piece of music with the delicacy it deserves, delivering low-level dynamic shifts with an impressive lightness of touch. Sure, there remains plenty of authority here, how could there not be with all the muscle present, but the Halo proves that it has sophistication to go along with it. Connecting various digital sources reveals the built-in DAC to be a good one. It plays all kinds of music files without issue and delivers a sound packed with insight and enthusiasm. There isn’t quite the purity we hear through the analogue inputs, but this number-crunching module remains an entertaining performer. The good news continues with the phono stage. While no replacement for a good dedicated outboard unit, it preserves the pleasing qualities of the line inputs. There’s a good degree of transparency here, and strong, well developed dynamics. It’s certainly better than most built-in phono modules we have come across. Background noise levels are impressively low too. The headphone output is another well-engineered circuit. It’s clear and consistent with the amplifiers performance through the speaker outputs. It’s a dedicated module built around a Texas Instruments TPA6120A chip. We use a range of headphones, from Beyerdynamics’ T1 right the way through to a pair of AKG K550s, without issue. This is a good performer. We’re pleasantly surprised by the Halo Integrated. It’s not often that such a fully-specified amplifier still delivers top-class sound quality. We like how Parasound hasn’t just treated the extra features like a box-ticking exercise, but has worked hard to make them perform well. If you’re after one do-it-all amp, there are few better alternatives.